Post-sushi and Thai takeout, chopsticks are upcycled into this sustainable, dimmable table lamp. When it comes to harsh overhead lights: Just say no. Opt for the soft, romantic glow of this handmade lamp instead. 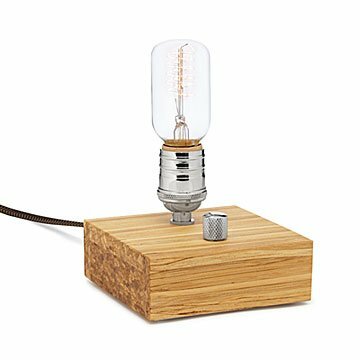 The sustainable design is handcrafted from recycled bamboo chopsticks and an old-fashioned Edison bulb—which might make it the coolest lamp we've ever seen. Here's what else we love: It's dimmable. That means brightness on a scale from "novel-reading after dinner" to "long afternoon nap". Though it's not required, it's highly encouraged that you nosh on thai takeout by the lamp, because how meta is that? Designed by Dan Emery . Handmade in Vancouver, Canada. Dan Emery started designing lighting by accident. Between renovating and flipping houses in his hometown, Montreal, he would tinker with small electrical and carpentry projects. His small “burning” ideas turned into larger, tangible ones—and soon he left his full-time career in film and TV to start start his own business making unique lights. We think that was his brightest idea yet. Dust with clean soft cloth only. Do not use any cleaners or solvents on the wood base. Includes a 60 watt incandescent edison lightbulb.